It is now widely accepted that many species are not perfectly detectable during an ecological survey. This means that, sometimes, a species that is present at a site will not be detected by an observer (or observers) during a survey of that site. The probability that the species will be detected if it is present (its ‘detectability’) is influenced by many factors. 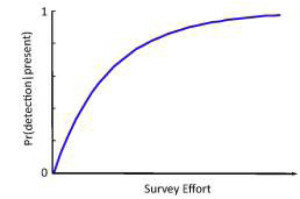 One of the most important factors is the level of effort put into the survey. 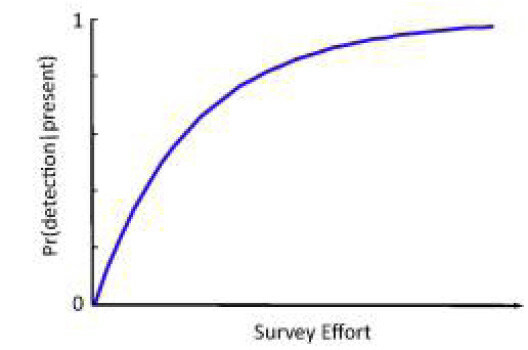 In general, the more effort that is expended, the higher the chance of detecting the species (Figure 1). Why do we care about this? Well, there are many reasons. Imperfect detectability affects our ability to determine a range of important ecological metrics, such as the size of a population and the spatial extent or distribution of a species. It also makes it difficult to detect changes in these metrics, which is particularly important when we invest valuable funds in programs designed to address things such as declining population size and shrinking ranges. But the implications of imperfect detectability can be particularly severe when we are considering the potential impacts of development on a threatened species. Falsely assuming the species is absent may mean that decisions about the future use of the site will cause unknown impacts on the species. In many cases, the species will be lost from the site and, at worst, the chance of the species going extinct will be increased. Despite this, most environmental impact assessment regulations do not specify requirements for survey effort to ensure that the probability of detecting threatened species is high. The spiny rice-flower (Pimelea spinescens subsp. 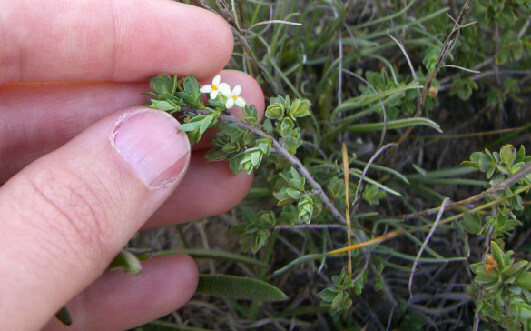 spinescens) is a shrub endemic to the grasslands of the Victorian Volcanic Plains west of Melbourne. It is listed as critically endangered under the EPBC Act. Working against its chances of effective protection is the fact that it can be very difficult to detect during environmental impact assessment surveys, especially at sites where the biomass of kangaroo grass is high. In the past I have undertaken a range of studies on various aspects of detectability (see the section below, ‘Have we looked hard enough?’). 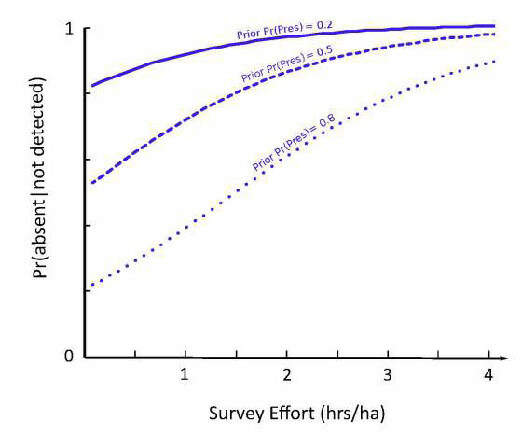 In this most recent study we sought to demonstrate how to use detectability estimates to set minimum survey effort requirements for environmental impact assessments (Garrard et al, 2015). In our analysis we considered two methods for determining minimum survey effort requirements for threatened species during environmental impact assessments. One method allows the regulator to specify the survey effort required to ensure that the species will be detected (with some probability) if it is present. This method uses a simple relationship between detectability and survey effort to estimate the probability of detection given the species is present. The second method allows the regulator to place the burden on the developer to demonstrate that the species is absent from the site. This requires information on detectability and survey effort, as well as information on the belief – prior to conducting surveys – that the species is present. The basic premise of this method is that, when surveying a site that you have good reason to believe is occupied by the species (for example, because the species has previously been recorded there, or because the habitat is thought to be suitable), a greater investment in survey effort is required to convince you (or anyone else!) that the species is truly absent if it is not detected than if you were surveying a site that was deemed unlikely to contain the species (See the box ‘Have we looked hard enough?’). We applied each of these methods to estimate survey effort requirements for Pimelea spinescens, a critically endangered native grassland plant species. We found that Pimelea spinescens has a detection probability of less than 0.53. This means that, during a survey of a site that contains the species, about . of the observers won’t find it. We also found that detectability of the species is substantially higher when experienced observers are used, and when the cover of the dominant grass species (kangaroo grass, Themeda triandra) is low. The survey effort required to achieve a 0.95 (95%) probability of detecting the species when it is present is around 200 minutes per hectare for an observer experienced in grassland surveys, surveying at a site where the cover of Themeda triandra is 35%. This increases dramatically when a less experienced observer is used (Figure 2). 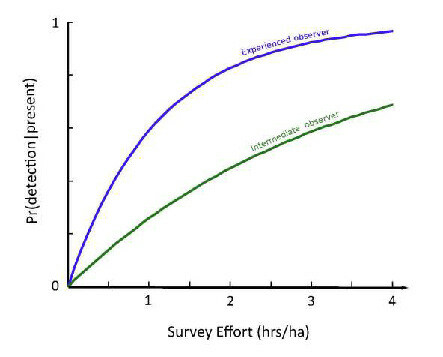 Figure 2: Detectability curves for experienced and intermediate observers at sites where the cover of Themeda triandra is 35%. When undertaken by an experienced observer at sites with 35% Themeda cover, less than 2 hours (104 mins) per hectare is required to demonstrate that the species is absent with probability of 0.95, when the prior belief in presence is low (prior probability of presence = 0.2). 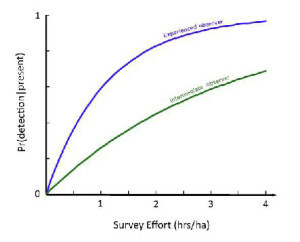 This increases to more than 3 hours per hectare when the species is thought equally likely to be present as absent before survey (prior probability of presence = 0.5), and to almost 5 hours per hectare when there is strong evidence to believe the species is present (prior probability of presence = 0.8) (Figure 3). 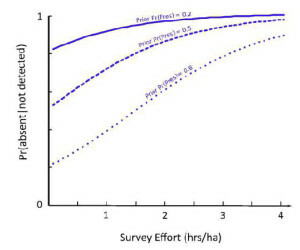 Figure 3: The survey effort required to demonstrate absence when no detections are made increases with the prior belief in species’ presence. All curves are for an experienced observer searching at a site with 35% Themeda triandra cover. What does this add up to? Most importantly it underscores that determining minimum survey effort requirements is not something to take for granted (or make up as you go). It involves making decisions about the level of risk to the species we (as a society) are prepared to accept and acknowledge the trade-offs between the site-level value of the species and the value of alternative uses of the site. Determining minimum survey effort requirements also depends on where the burden of proof lies. For example, should it be the responsibility of the developer (or person undertaking activity at the site) to demonstrate that the species is absent from the site? Or should the regulator make an assessment based on whether the reported survey effort was sufficient to detect the species if it was present. These questions cannot be answered by science alone. What does this mean for the spiny rice-flower? 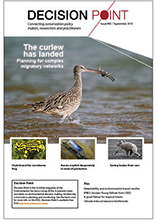 The qualitative findings of our study – that experienced observers and low cover of dominant grasses improve detectability of Pimelea spinescens – are already reflected in the guidelines for determining significant impact for the species under the EPBC Act. Our study has demonstrated – for the first time – how much survey effort is required to detect the species. The minimum survey effort requirements identified in our study are well above the effort traditionally expended in environmental impact assessments for this species. We also showed how much MORE survey effort is required if the observer does not have the appropriate experience, or the grass biomass at the site is high. The latter finding is particularly important in urban and urban fringe environments, where biomass reduction management through burning or mowing is limited or non-existent. 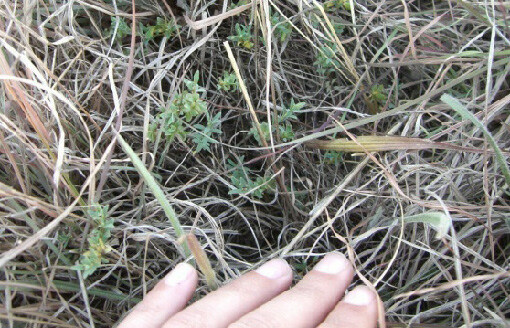 We have shown that taking action to reduce the cover of Themeda prior to surveying for Pimelea spinescens may reduce survey effort requirements by as much as 50% or 75%. We argue that minimum survey requirements be established for all species listed under threatened species legislation and hope that our findings will provide an impetus for collecting, compiling, and synthesizing quantitative detectability estimates for a broad range of plant and animal species. How long do we have to look? While many ecologists are aware of issues of imperfect detection during biological surveys, policy has yet to catch up with this issue. How long do we need to spend surveying in a single visit to a site to achieve a reasonable chance that we will detect a threatened plant species if it’s present? If the species is especially cryptic such that you’re unlikely to detect it in any one visit, but the habitat is ideal, you need to revisit the site many times. If the habitat is poor and the species is easy to detect, a lesser effort is required. Trait-based models should provide sensible bounded estimates of detectability on which to base survey design and effort requirements.